Tokyo Crusaders have new playing jerseys on the way!! We’re going back to our roots with a “heritage jersey”, so the color is mainly Sky Blue to reflect the club’s original kit but with a nice modern feel and high performance material. 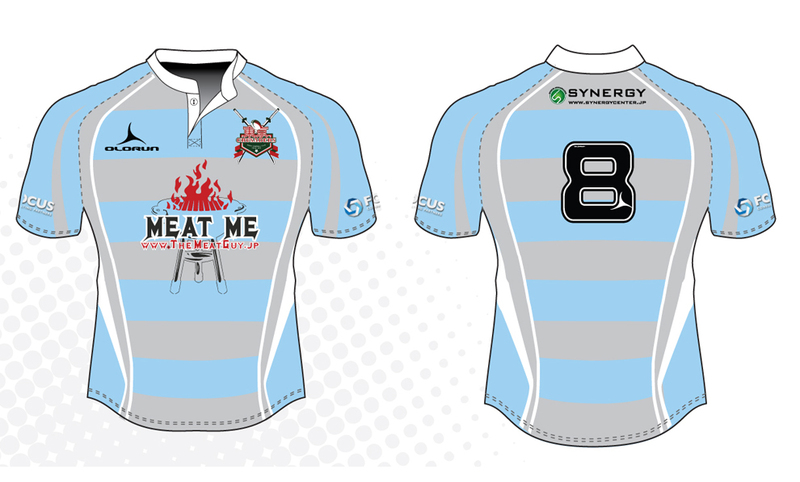 The front of the jersey features an awesome flaming grill design for our brand new shirt sponsor The Meat Guy! Our other new sponsor this season SYNERGY Center appear on the back and Focus Consulting Partners are sleeve sponsor. The jerseys are made by Olorun (UK) and will be high quality shirts. They will be in their LAXFIT range, designed to be close fitting around the chest and arms but a little looser than the EXOFIT (skin tight) jerseys. There will be a set of 25 bought as playing kit and we will do our very best to get these in an appropriate range of sizes for the current squad. Players and supporters can also order their own jersey to wear casually if they would like. The order deadline is November 12th (5pm Japan time), as we’ll be submitting the full order on 13th November. If you would like a jersey, click on the link and let Yorkie know what size and number you would like before 12th November. The jersey will cost ¥5,000 (postage not included if you need to have your jersey delivered). Expected delivery time is about 10-12 weeks, so we can expect to receive them in January or February. Click here to see Olorun’s size guide. Tokyo Crusaders would like to thank our sponsors for making this new playing kit possible. Why not give them a thumbs up on their Facebook pages – just follow the links below.